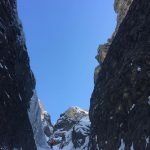 Another deep, angry roar fills our tiny couloir, the sound of hundreds of tons of cascading snow and rock amplified as it bounces around the steep walls looming over us. I glance up towards Grant, tucked safely into the same niche in the wall as me and peering across the wide valley in front of us, an unmistakeable look of concern in his eyes. Slightly further down the couloir Joel has paused in his tentative explorations, and is also staring at the source of the cacophony: as the sun crawls higher into the sky, the south-east facing slopes under the Frêtes du Grenier, a kilometre away from us, are shrugging off another layer from their thin, fragile snowpack. 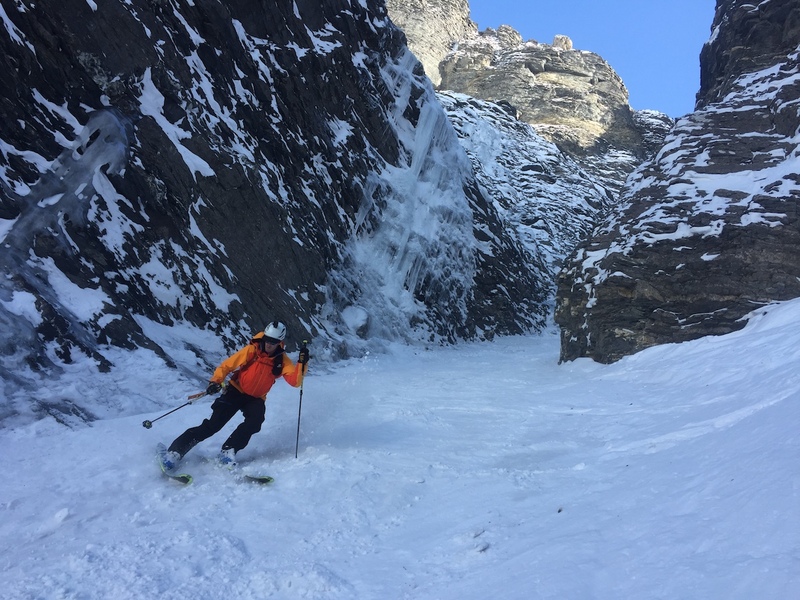 We feel relatively safe, hidden from the sun’s rays and the unseasonably warm temperatures in our cavernous north-west facing couloir, and if we weren’t completely confident about the low avalanche risk of our chosen route then we wouldn’t be here. But the noise, just like the dozen that preceded it, still fills us with an understandable sense of dread. I call to my friends, thinking aloud, only half making conversation with Joel and Grant. 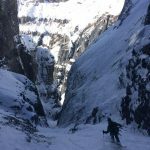 After a 6am start and a sweat-drenched 1700m of skinning to a barren and remote summit in the Haute-Savoie, we are deep within Mont Buet’s aptly named Grand Couloir, a narrow, precipitous ravine cut through the imposing buttresses propping up the seldom-skied north-west face, and at 5.3 on the Toponeige scale, it isn’t a descent to be entered into lightly. Joel and I had scanned the first part of the route through binoculars just the day before from the top of another line nearly 20km away, and from a distance, we’d thought the snow cover looked good enough to give it a try. But then again, it is February 2017, the French Alps are enjoying the worst winter season in living memory, and the often fruitless quest for decent snow – or any snow, for that matter – has brought us to some strange, remarkable places. 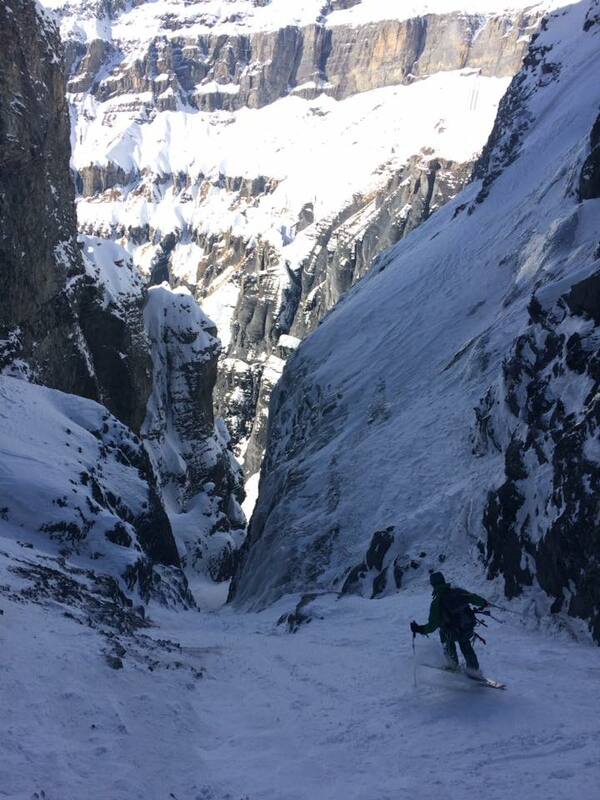 This incredible line, a thin and steep vein of snow winding its way down through nearly a thousand metres of crumbling limestone cliffs, rarely drops below 45°, and as we delve further and further into the couloir the difficulties begin. 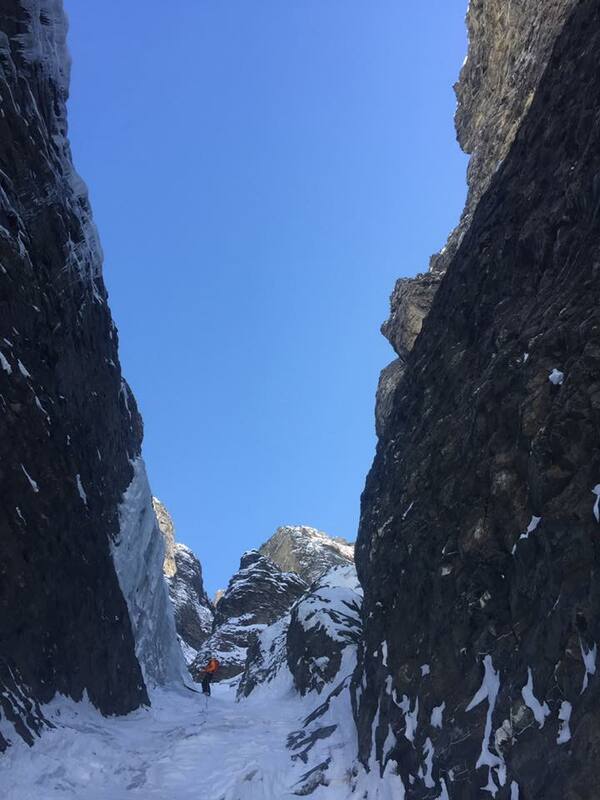 A narrow choke point has left a steeper rocky section devoid of snow, and the sheer walls don’t offer anywhere to build a rappel anchor, so we are forced to swap our skis for crampons and climb down. 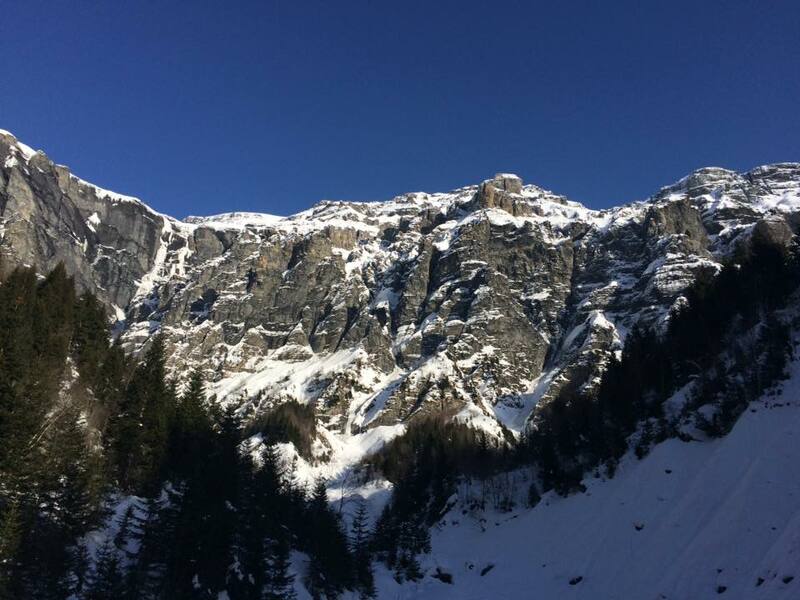 A few hundred metres lower, the base of frozen waterfall peeks through the thin snow, and after creeping carefully towards the bare blue ice to make a V-thread anchor, we rappel 30m to more skiable snow. We think through the obstacles as they present themselves, carefully and methodically working our way down the couloir, and before long we find ourselves in the wooded glade of the Chalets des Fonds, basking in glorious sunshine but still under the shadow of our line, and just 6km of walking in our ski boots away from the nearest bar. 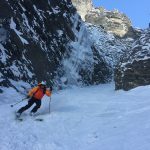 It was no day for epic face shots, but an involving and incredible descent through wild and remote terrain in a seldom-skied corner of the Haute-Savoie: ski mountaineering at its finest.